Instagram is one of the most successful social networks and is now in the very top of the social networks that come to mind when asking users. That's why organizing an Instagram Giveaway is an excellent opportunity to grow your community. But while it allows you to host giveaways with a lot of engagement, it's important to know Instagram's policy on promotions to make sure that we comply with the good practices of this social network. In this guide, we describe all the steps you should follow to publish your giveaway on Instagram, complying with Instagram's policy and following the good practices. Step 11. And how do I select the winners? Note: If you already have an Easypromos account, click here to log in. Pre-configuration with texts ready to finish and publish. Reviewed texts that guarantee that the participation requirements follow the policies and good practices for each social network. Royalty free predefined images free for you to edit, use and share. Detailed tutorial to configure the giveaway. To see the templates, once in the control panel, go to the "Utilities" menu in the top and find the menu item "Templates". Click there and you will see the full list of available templates. To make it easier for you to find the template that fits best with your giveaway, you'll be able to filter by type of campaign, so in case you are creating your giveaway for a special occasion, event or holiday, you can see the templates we have prepared for the occasion: summer campaign, Halloween, Christmas, etc. A pop-up will open where we explain what you get with the template and how it works. Access to the tutorial on how to finalize the giveaway and select the winners. Note: Downloading and publishing the template is free. To select the winners with Easypromos, check the payment plans. If you've followed step 3 of this tutorial, you'll have received an email with all the material of the Instagram Giveaway template, including the text for the post that you can easily copy to be able to edit it and adapt it to your contest. Tip! If you're editing the text on your computer, save the document and send it to your own email to have it available when you're going to publish the post. Remember that you have to publish the post directly in the Instagram app. You will find two attached images in the email; one is for the giveaway post and one is for Stories. Post image: The images are seen in 600x600 px but we recommend you to upload them in 1080x1080 px. If your image is in landscape format, you can upload it in 1080x566 px but Instagram will show it in 600x400 px. And if it's in portrait format, you can upload it in 1080x1350 px and it will be shown in 600x749 px. Story image: The size for images and videos for Instagram Stories is 750x1334 px. Tip! You know they say that a picture is worth a thousand words, so to grab the attention of the users and encourage them to enter the giveaway, make the most of the image and place the word "Giveaway" in it and, if possible, design an image where the prize on offer is visible. Nothing works better than actually seeing the fantastic prize you're raffling. It's recommended to always include the terms and conditions in any giveaway, where you explain all the important aspects of the giveaway: prize on offer, entry dates, entry conditions, organizing company or brand, etc. To help you write your terms and conditions, we offer a template in .DOC and PDF that covers all the important points that should be included in the terms and conditions. This document has been written up by a legal agency that's specialized in online promotions and giveaways and you will see that it contains empty spaces marked with yellow which are the ones you should fill in in order to adapt the terms and conditions to your giveaway. 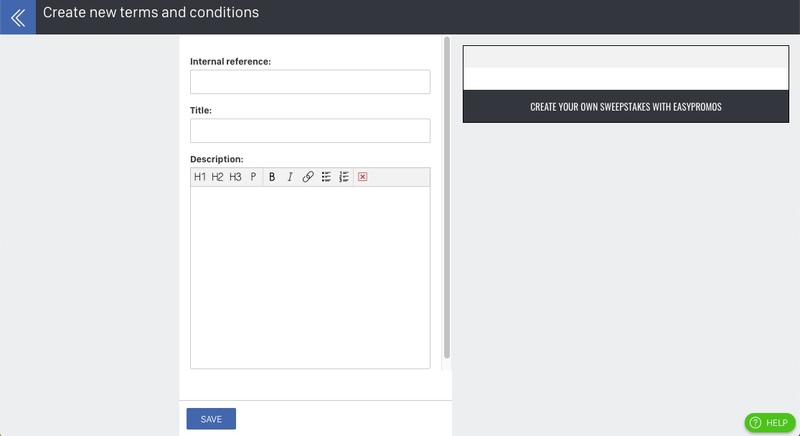 When you've filled in the fields with the information about your giveaway, the next step is to publish the terms and conditions so that you can use them in your giveaway. To do this, Easypromos offers a tool to host the terms and conditions in web format where you can upload the complete text and it gives you a link that you can use to share on your Instagram profile, in the BIO, in the giveaway post, in Stories or any other channel. Note: See here how to use the free tool to host your terms and conditions. You've probably prepared the material for the giveaway post on a desktop computer, so you need to keep in mind that you should publish the post itself from the Instagram mobile app. To have everything at hand when you're going to publish, a good idea is to send everything to an email that you have access to on the mobile phone. Time has come to publish the giveaway post so that the users can begin participating. Recover the email that you've sent to yourself with all that you need for the post and start creating the post. Tip! After pasting the text for the post, remember to complete it with the emojis that the Instagram app offers, to make the post more visually attractive, as well as adding hashtags if necessary. A feature that makes Instagram special (and makes it cause many headaches) is that it's not possible to include clickable links, except for in the profile BIO, where Instagram allows one link. Use this to post the link to the terms and conditions that you've obtained in Step 6 of this tutorial. That way, the users have easy access to the terms and conditions during the whole giveaway period. Tip! If you publish the link in the BIO, you can include the sentence "Link to T&C's in BIO" in the giveaway post. Disseminate the giveaway in your Stories and direct users to the profile so they can participate by commenting on the post. Stories help achieve better reach and visibility being the resource that's most used and most appreciated by Instagrammers. You can use the hashtag #giveaway in the post so that it will show up if users search for this hashtag. All hashtags in your posts become clickable links which means that users more easily can find content that is of their interest, such as giveaways. Promote the giveaway post to reach more users and that way, get more participation. Important note: On Instagram, you can promote posts directly from the Instagram app, or you can create new sponsored posts from Facebook Ads Manager. In both cases, a new Instagram is created and this means that the comments on the sponsored post will not automatically be added to the comments on the original giveaway post. If you want to add these comments to the giveaway, find out how to do it here. Do you need more ideas to how to disseminate your giveaway to make it a success? Don't miss out on this guide with 10 recommendations to guarantee good reach of an Instagram giveaway. When the entry period has ended, the time has come to finalizing the giveaway by selecting the winners. To do this, Easypromos offers the "Instagram Giveaway" app that will allow you to import the giveaway post with all the users that have commented on the post to the control panel, and that way carry out the random draw to select the winner. The process to select the winners has been designed to be intuitive and guided but if it's your first giveaway with Easypromos, we recommend you follow the step by step tutorial to not forget anything and finalize the giveaway properly.